A tiny tram trundles tourists around Tito's private playground of BrijuniJust offshore the town of Fažana, 8km north of Pula, lies a pile of offshore islands called Brijuni. Though settled since prehistoric times, and a posh playground for European aristocracy at the turn of the 20th century, the islands are most famous for being Tito's "Camp David." This was where, from 1947 until his death in 1980, the Yugoslav leader went to get away from dictator duties, receiving visiting heads of state and international celebrities in style, puttering around his gardens, and putting around Continental Europe's first 18-hole golf course—still available for tee times and kept trim (and fertilized) by large roaming herds of fallow deer. Boats from Fažana to the island (a 15-mintue ride) leave roughly every 60–90 minutes spring through fall (down to six a day in Mar. and Nov., three a day in Feb. and Dec.). The price of passage (150kn/$32) includes the minitrain tour on the island. Book ahead for a tour—English guaranteed only at 11:30am (tel. +385-(0)52-525-882, www.brijuni.hr).Brijuni is now protected as a national park, but it's still an island resort (Naomi Campbell, Placido Domingo, and John Malkovich—whom locals are proud to point out has Croatian ancestry—have all vacationed at the hotel here). Brijuni is also something of a monument to Josip "Tito" Broz, with his '53 Cadillac convertible (available for half-hour tours of the island for 3,000 kn) under an awning outside two museums devoted to the former dictator. One of the museums preserves, in taxidermied form, defunct specimens from the island's dwindling safari park (lions, tigers, and bears, yes, but also chimpanzees, kangaroos, and midget giraffes). 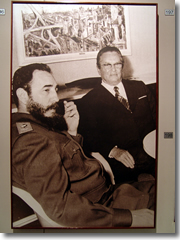 The museums on Brijuni commemorate Marshal Tito's time on the island, meeting with world leaders like Fidel Castro.The other museum, upstairs, is filled with photographs of Tito playing with his animals, clearing brush, and chumming around with the rich and powerful. These ran the gamut from heads of state to Hollywood royalty: Queen Elizabeth, Fidel Castro (pictured on the left there), Ho Chi Minh, Sophia Loren, Richard Burton (who actually played Tito once in a movie). Many former Yugoslavs have conflicted, complex feelings about their former iron man. Sure, he was a dictator, but he was their dictator. 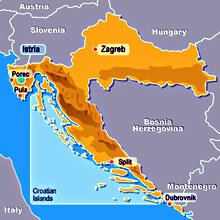 A Croat once told me, a bit wistfully, "Now we are free, but we must also now struggle every day. Under Tito, nobody was rich…but nobody was poor, either." Regardless of income level or political connections, anyone can now stay at this former presidential compound to soak in the sun, trade pleasantries with Koki, a caged cockatoo Tito trained to talk, and trek out to see the 400 fossilized dinosaur footprints. There are two standard hotels (doubles from €63) and three Art Nouveau villas for rent (from €203). 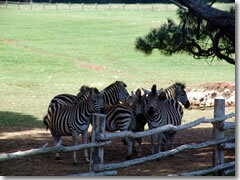 The zebras in the safari park on BrijuniMost visitors come on a day trip, though, to spend an hour tooling around the island aboard a miniature tourist train led by a disinterested guide doling out facts, figures, and historical tidbits over a loudspeaker. 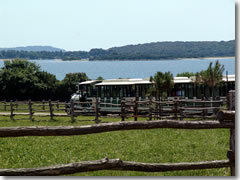 The tour highlight is the small safari park, still home to endangered Istrian white oxen, Shetland ponies, Somali sheep, ostriches, llamas, a thriving herd of zebras, and a pair of ageing Indian elephants, Lanka and Sonny, gifts from Indira Gandhi that now pose for pictures beside a strategically placed snack hut and bathrooms. Officially, day-trippers are supposed to stick with their guide for their full 2.5 hours on the island (save for the half-hour of free time granted at the café/souvenir shop), but I was tired of whizzing past everything and being fed copious amounts of information but given no time to digest it or to get out and explore on my own. The minitrain had hurtled past stone chapels left over from long-vanished medieval villages, a platform sprouting a few broken columns marking a Roman temple at the head of a narrow bay, and a 1,700-year-old olive tree on the edge of a grassy expanse just above the town. The Roman temple on Brijuni.So, during the snacks and souvenirs break, I ditched the group for a tree-shaded bench and dug into the ham, cheese and tomato sandwiches I'd put together at my hotel's breakfast buffet, a bag of sweet cherries, and giant bottle of beer I'd picked up in Fažana. I took a spin though the museums and, with an hour to go before the return ferry, rented a bike from the hotel nearest the docks and headed back out to see the island at my own pace. I pedaled down asphalt lanes shaded by avenues of magnificent Aleppo pines, stumbled over the neatly excavated foundations of a Byzantine village the tour had overlooked completely, and returned to the ancient ruins to take some photographs. 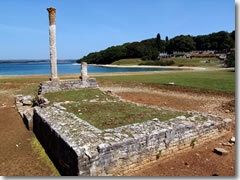 As I sat at the end of a stone dock on that little bay, gazing across the turquoise waters at the terraced remains of the 1,900-year-old Roman villa and listening to the slap of waves against stone, another minitrain trundled along, its guide cheerily spewing Tito trivia in German. I waved, and, once they passed, realized I'd probably be have this site all to myself for the next 20 minutes. I ditched my bike by the broken columns, stripped to my skivvies, and dove into the cool, clear waters of the Adriatic, swimming out into the bay above the sunken ruins of an ancient pier.